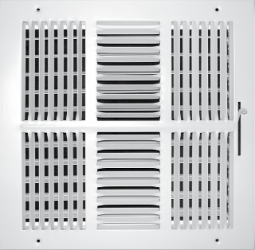 Determine if your registers are aluminum or steel by placing a magnet on the face of the vent itself. If it sticks to all parts of the face, it's steel. If it only sticks to the screws, it's aluminum. If your registers are made of plastic, use our covers for aluminum registers. Note: some plastic registers have recessed screws. If this is the case, (leaving the existing screws in place) simply install 4 new steel screws into the face of the register for the magnets to catch. The screws will need to be installed halfway between the outer edges of the vent (shown in the picture below). Elima-Draft recommends 1/2” self-tapping lath screws. Measure the outside dimensions of your register. This measurement will correspond to the Elima-Draft cover item number you will need (ie: ELMDFT11A will fit a register 11" x 11” that is aluminum). If your aluminum register measures slightly larger (ie; 11 1/4" x 11 1/4"), use the cover for 11" x 11" registers. 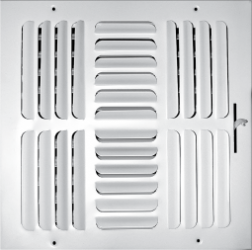 Our 4 in 1 rectangle cover will fit vents sized from 6” x 12” up to 8” x 14”. The same steps apply to our Filtered Allergen Relief covers, which can be used all year round for healthier, cleaner air in your home. Not all vents are created equal…. Some are “low profile” and will need extra magnets to reach the screws. Extra magnets can be purchased in our "shop" section. Some have screws that have been tightened too much. If you notice (for aluminum vents) that the magnetic draw seems weak, simply back out your vent screws a half turn or so. This will allow more contact with the magnets, while not loosening the vent itself.